Ahhhh the ups and downs of comfort food season. On one hand, I want all the rich foods of the holidays, still, and things like pot pie and mac and cheese. I’m enjoying baking sourdough too. All the reason I’m making mini loaves now, else I’ll devour the entire loaf all too quickly. On the other hand, my body can only tolerate so much. After all, summer will be here before we know it and I’ll be trying to squeeze into shorts again :o. Good thing my bathing suit is stretchy. A black one piece goes a long way in concealing those winter indulgences and my 45+ body. 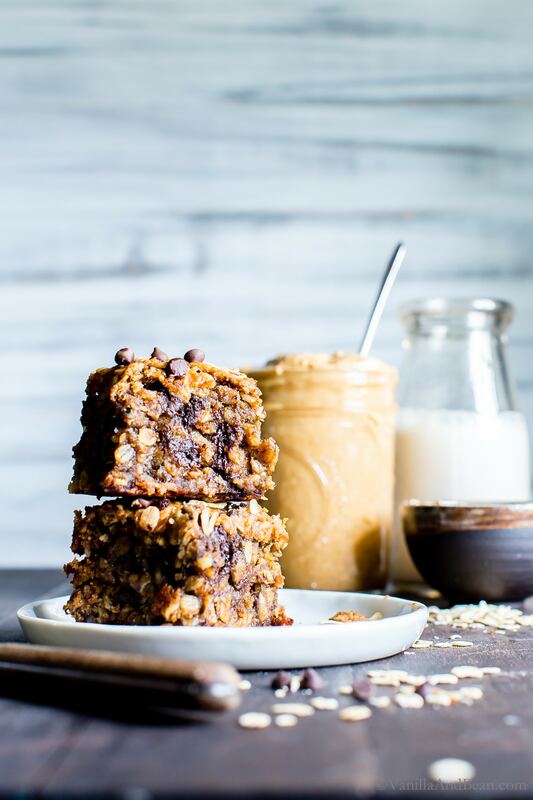 Yet, while I’d consider these Peanut Butter Banana Chocolate Chip Breakfast Bars a bit of an indulgence, they’re made of all the good things and a few more, that would go into a bowl of oatmeal, granola or granola bars with a bit of chocolate, of course. I couldn’t help but add it in. 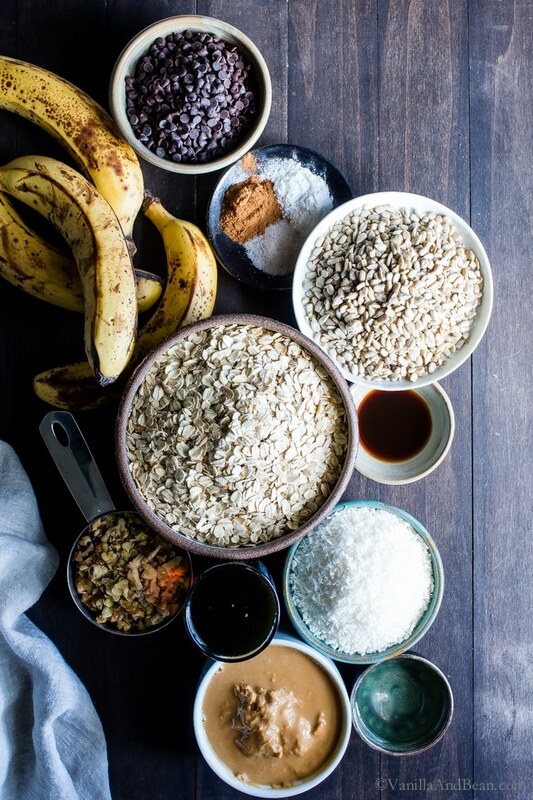 These bars come together with ease, and using mostly pantry staples. 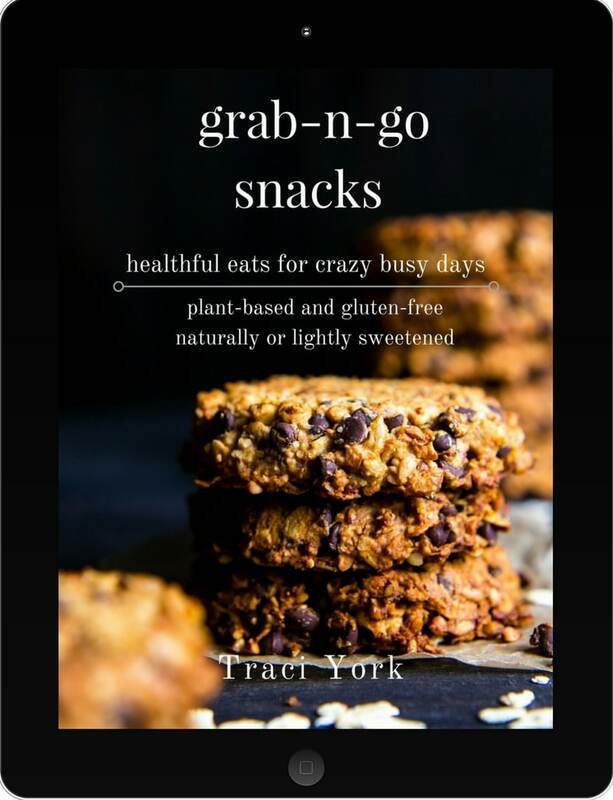 Ingredients such as oats, sunflower seeds, walnuts, peanut butter, bananas, maple syrup, chocolate chips, cinnamon and vanilla come together to make a crave-worthy grab n’ go breakfast or afternoon snack. Simply mash-up and mix all the wet ingredients, then pour them into the dry ingredients. Spoon into a pan and bake. A long shelf life: I’ve squeezed 5 days out of these bars – at room temperature. 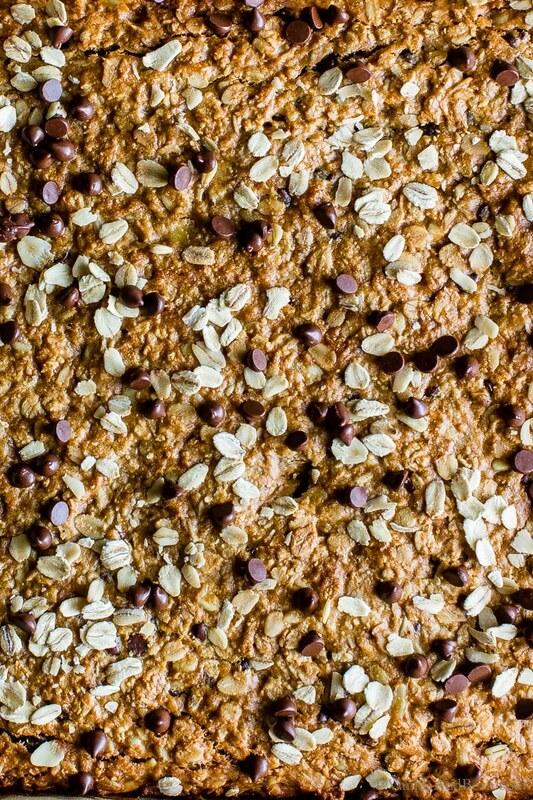 Freezer friendly: this recipe makes a BIG batch and BIG bars. Cut them small and freeze half or more if needed. Versatility: Feel free to play with the ingredients and use what you have on hand. No chocolate? Throw in some diced, dried fruit. Not a fan of walnuts? Toss in some chopped pecans. Have a sensitivity or allergy to peanuts? Give almond butter a go. Hello (!!) breakfast or snack. These little bars have me dreaming of summer… not the bathing suit part. They’ll be a delicious addition to road trips, hiking, picnics or for anytime, a simple breakfast or afternoon pick-me-up. For a little bit of effort, they go a long way. In 9"x9" baking pan (22cm X 22cm) - or see the link in notes to use a different size pan - use coconut oil to oil the pan making sure the corners are well covered. Use parchment paper to line the pan leaving handles hanging over the edge to lift the 'cake' out of the pan easily after baking. Set aside. Set oven rack in center and preheat oven to 350F (177C). 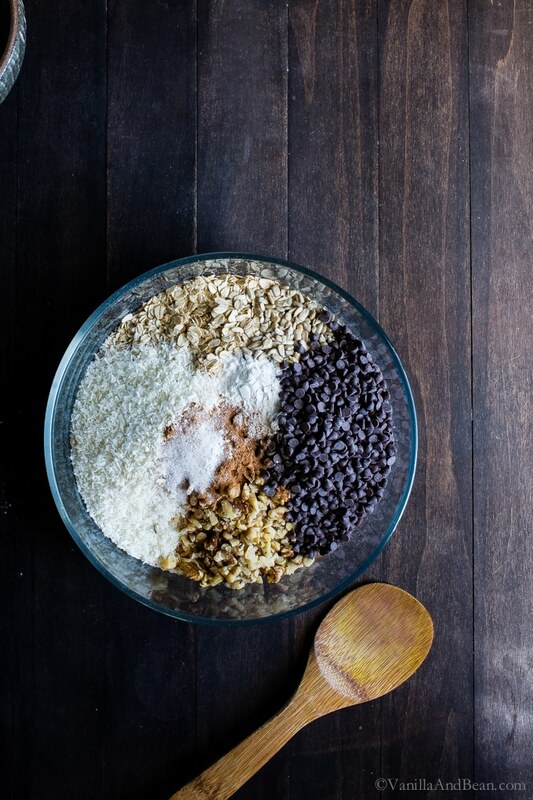 For the dry ingredients: Reserve a few tablespoons of oats and chocolate chips for sprinkling on top, if desired. 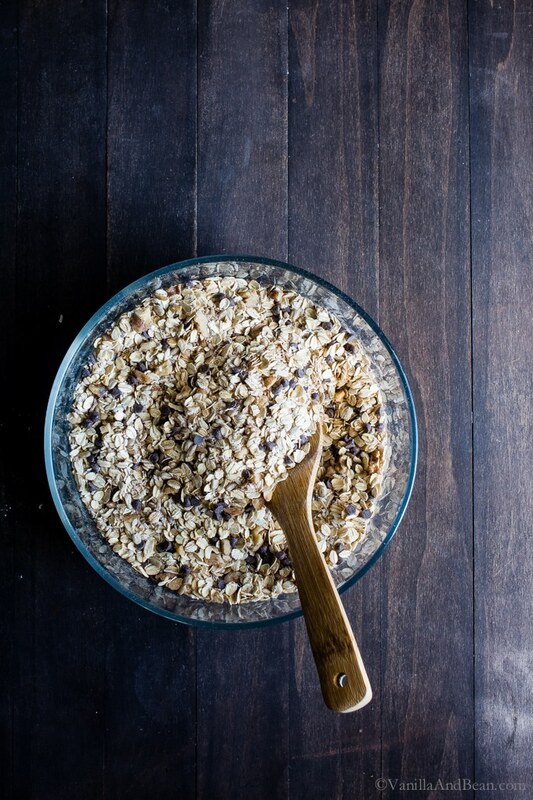 In a large mixing bowl, mix the oats, walnuts, coconut, sunflower seeds, chocolate chips, cinnamon, baking soda and salt. Set aside. For the wet ingredients: Make sure to start with room temperature ingredients. 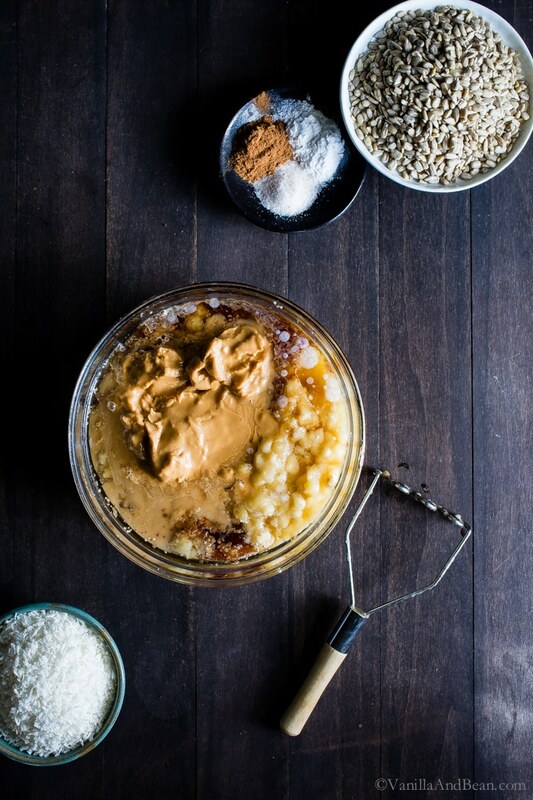 In a medium mixing bowl, mash the bananas, then add the peanut butter, syrup, oil, water and extract. Use the masher to mix the ingredients, then whisk vigorously until all the wet ingredients come together and are smooth(ish). Pour the wet ingredients into the dry ingredients. 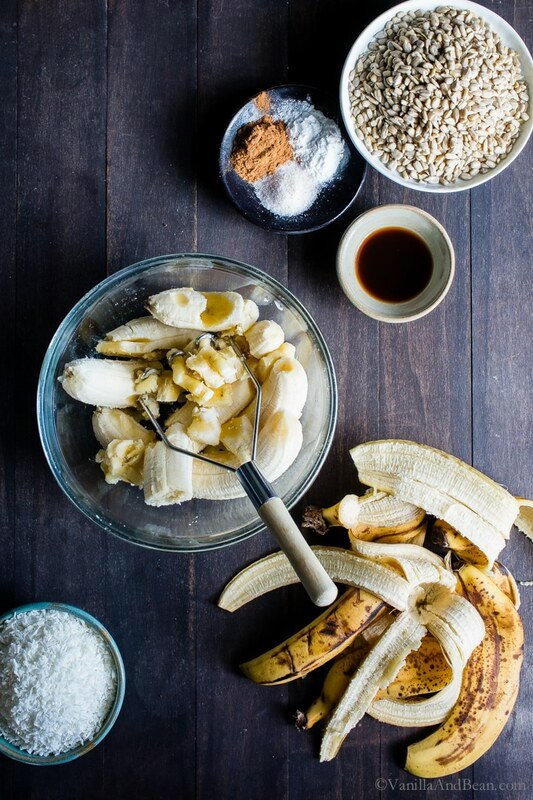 Using a sturdy wooden spoon and a strong arm, mix the ingredients throughly. Spoon into the prepared pan and spread the mixture evenly, making sure to push the batter into the corners of the pan. 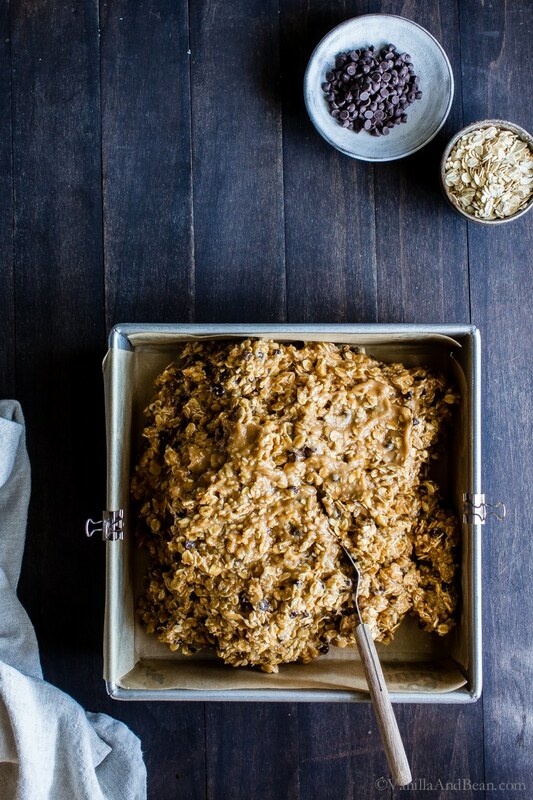 Sprinkle the reserved oats and chocolate chips on top. Bake the 'cake' for 30-35 minutes, using a toothpick to check for doneness starting at 30 minutes. The 'cake' is done when the top is golden and the center slightly springs back when gently pressed. The toothpick will come out clean or with very few crumbs, yet with some chocolate holding on to it. Cool completely (very important), then use the parchment as handles to lift the 'cake' out of the pan. (See notes below on cutting). The pieces will be slightly crumbly and very moist. Store at room temperature for up to five days, covered. These freeze beautifully too for up to two weeks. *Cutting the Bars: Since this recipe is somewhat crumbly when cutting, I've found they're easier to cut when lifted from the pan whole (although I cut them in the pan when in a hurry - it is messier). Use a serrated bread knife to gently saw through the top crust, then swiftly press to cut all the way down, then slide the knife out while gently holding the rows together. Repeat as needed. Several readers commented (see below) that they refrigerated the bars after they cooled which resulted in a less crumbly bar. This recipe is versatile! Feel free to play with the ingredients and use what you have on hand. No chocolate? Throw in some diced, dried fruit. Not a fan of walnuts? Toss in some chopped pecans. Have a sensitivity or allergy to peanuts? Give almond butter a go. All Recipes has a pan conversion chart here if you need. Please note that I've only made this recipe in a 9"x9" pan. Recipe inspired by Vitamix Create. I recently found out I cannot eat sunflower seeds/oil or maple syrup. What would you suggest as alternatives in this recipe? Can’t want to try it! Hi Brooke. I’m sorry to hear this. For the sunflower seeds, you can leave them out and replace them with more oats (equivalent) but for the maple syrup, I’m not sure there is a substitute. You could try agave but the flavor will be impacted. I’m afraid honey may be too strong. Since I’ve not tried this recipe with other sugars, I’m unable to confidently say what would work. I wish I could be of more help. I am a little hesitant in using coconut oil since hearing the latest report that came out cautioning that coconut oil is very high in saturated fats. Do you have any suggestions on a replacement? Butter? But then I’d be substituting one saturated fat for another. These look so yummy! Hi Stephanie! Thank you for your note. I’ve only made this recipe using coconut oil. I’ve done a great deal of reading on coconut oil and I am comfortable with using it – otherwise I wouldn’t include it here. You could try another oil of your choice. I think butter would work fine, just be aware that butter has a water in it where coconut oil does not. I’m not sure how this would affect the outcome. I hope this helps. Thanks so much. I think I’ll try them as written with coconut oi first then try butter at later date.. Again thanks for your rapid response. I made these tonight – a big hit! I wanted to make a half recipe so instead of hunting around for a smaller pan I used a mini muffin tin. I greased some/used paper liners in others & baked them for 15 minutes. They came out easily & held together well. A great new breakfast bite for my fussy morning eaters! Yahoo! Thank you for sharing your tips and success, Lisa! I love the little bites idea and that your fussy morning eaters are happy! A win-win! These are really delicious, can’t stop eating them!! I’m curious, have they ever turned green for you? I substituted sunflower seed butter for the almond butter and maybe that created a green result somehow? It really looks like I added spinach…so crazy. Hey Jessica! Thank you for your note… so happy you’re enjoying the recipe! Thank you for your note on sunflower seed butter – yum! I’ve never seen these bars turn green – but I’ve not used sunflower seed butter in them either. I don’t understand how that would make them green! haha… So glad they still taste good! Its due to the chlorophyll from the sunflower seeds reacting to the baking soda. Its harmless but if you dont like the green color, try adding lemon juice a 1-2 tsp of lemon juice or another acid such as yogurt or buttermilk. You can also try reducing the baking soda. Hopefully it helps! Oh wow! Thank you for your note and tip, Julie. That’s so interesting! These bars are delicious frozen and reheated. It makes the bars gooey and the chocolate all melty!! 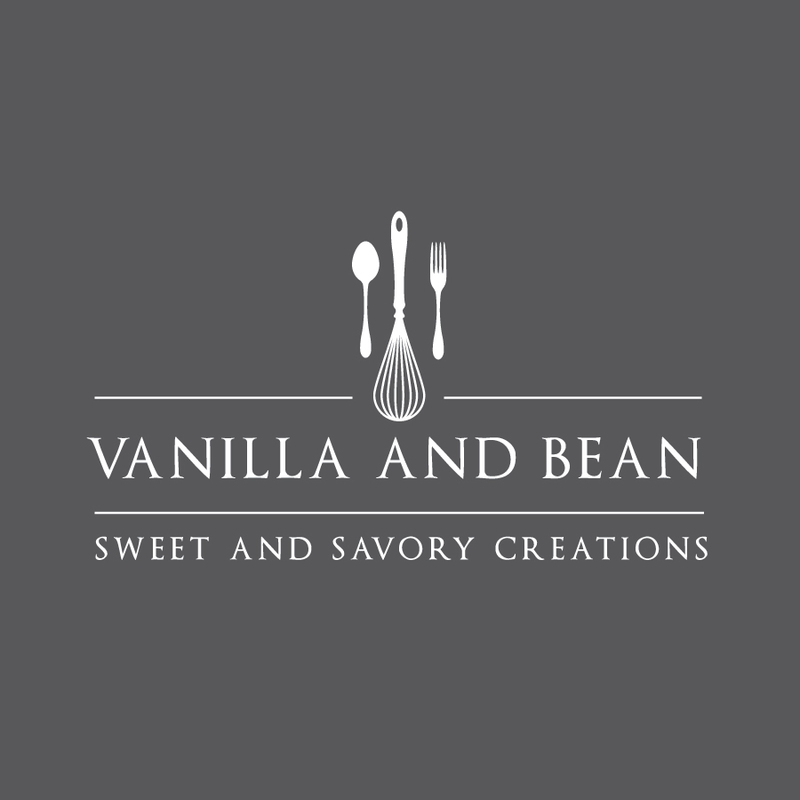 I think a warm bar with a scoop of vanilla ice cream would be the perfect dessert. Just saying. Oh goodness…. Stephanie! I’m heading to the kitchen right now to make another batch and to see if I have any ice cream! And I will be reheating them :D ! Thank you for your tip! Hello Rebekka! Thank you for stopping by. I do not have the USDA nutritional label for my recipes. Please feel free to plug the ingredients into any online calculator you’d like to use. I made these yesterday and they are so delicious! The only thing I added was sesame seeds. However, even though they cooked beautifully when they cooled I could not cut and remove them from the pan without falling apart a bit. After refrigerating overnight they have firmed up a bit. My question is, was my mixture too wet perhaps? Or do are these bars a bit crumbly? I love them and am, happy I can save myself from finishing the pan with keeping the remaining bars in the freezer. How long do they take to thaw…do you know? So happy you’re enjoying the bars and thank you for your note! The bars are a bit crumbly by nature, but it looks like refrigerating helps them hold together better (as you and another commentor indicated). I just leave mine out on the counter as I find them to hold together enough for handling. The mixture is very wet , prior to baking – this creates a very moist bar. Just make sure it’s mixed throughly so that every piece of oat is covered and moist. Undermixing may be causing the crumbly, I’m not sure. As far as freezing then thawing, I simply place mine on the counter overnight and they’re thawed by morning. I hope this helps! Thanks, I appreciate the follow-up! I’m pretty sure I mixed the batter well but the 4 bananas are probably a bit of a guess factor as bananas vary quite a bit in size. But these bars did not disappoint and over time I am sure I will get a “feel” for what the recipe needs. I hope you enjoyed them, Alexandra! I’ve been buying two bunches of bananas lately… one for turning brown and the other for freezing (smoothies). Then I don’t have to think about bananas all the time – lol!! We use a lot of them! Totally with you on the comfort food. It’s so so hard. But, you have created this amazing one just when I have a bunch of bananas sitting and staring at me and what is best is it’s natural sugars. So so beautiful!! Love granola and this is going to happen very soon. I feel your pain with the comfort food dilemma right now. I’ve been living in stretchy sweatpants and sweaters for so long I’m not sure what’s going to happen when spring/summer rolls around, lol! Either way, I would definitely make room for these bars. They look fudgy and chewy and so delicious! I made these over the weekend…I couldn’t resist the ingredient combo. They are pretty darned easy to make and you need just to keep an eye on these (as noted) at the 30 minute mark. Mine actually needed 35 minutes to return a clean toothpick. I only had an 8″ x 9″ square, so I used the “overflow” batter in a small round baking dish…so I got 2 for the price of 1! Definitely let them cool all the way. They were slightly crumbly as described but actually served up nicely on a plate once they were cool to the touch. My teenage son (who can never seem to eat enough) was surprisingly (albeit temporarily) satisfied after eating one square. I recommend storing in the fridge as they firmed up nicely overnight and I was able to leave this morning with one in a napkin, yielding very few crumbs. Bonus, they are indeed as delicious as they sound. Oh my Gennis! Thank you so much for your detailed notes… I love the refrigerator, no crumbs part and two for the price of one. I lol about your teen! That makes me happy, Gennis as does your note. Hooray! Such perfect bars, I need these in my life! I do NOT want to think about bathing suit weather, Traci – this past holiday I definitely overindulged – too much comfort food and wine for me. 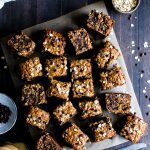 So, yes, it’s time to buckle down and think healthy – lots of salads and soup – but we all need something yummy like this gorgeous breakfast bar. I’m always running late for work so this would be a perfect breakfast grab and go for me! They taste great but something went wrong. Oh no! I’m so sorry to hear this Karen. I’m not sure about the 11×8 pan – I’ve not tested it in a larger pan. Do you use an oven thermometer? oven thermometer These are very moist, but I’ve not experienced them being gooey. And while they are crumbly by nature, I’ve not experienced them falling apart as written. I’m sorry these didn’t work for you. These look delicious. With my son from college coming home today for a visit, we will have to make them. We both love coconut so we might toss some in. I’ll let you know how it goes. Thank you for sharing! Thank you Heide! I hope you and your son enjoy these treats! Nothing wrong with both salads and baked goods this time of year! Baking is so soothing to the soul and little treats like this are such a delight on a cold winter day. 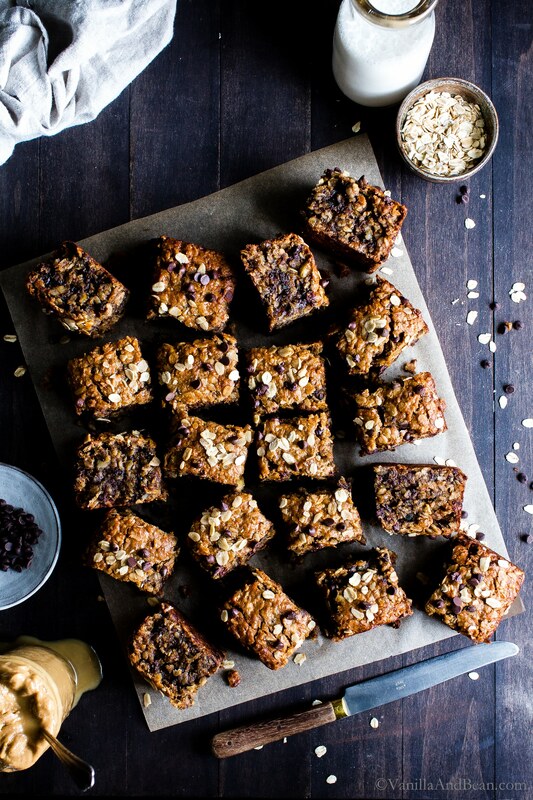 PB + chocolate + banana are heaven, and these squares look so soft and moist. Always love seeing what you’re up to in your kitchen, Traci! I just “invented” something very similar. Great minds! 💜💜💜 Now if only my photography would magically look like yours! I’m always looking for healthy alternatives to have with my morning cup of coffee. I’m loving the ease of this recipe and the fact that I have all the ingredients on hand to make the bars. Plus being able to freeze a few will save me from choosing something less bathing suit friendly to eat! Thanks, Traci! Hooray for having ingredients on hand! That’s the best and quite frankly is a motivating factor for me when I get the urge to bake. I hope you enjoy the recipe Jean! My kids would love the idea of these healthy cookies for breakfast and I love that they are more wholesome. Don’t remind me about bathing suit season please! I lol at your comment, Karen! Okay, we’ll just forget about bathing suits for now. I hope you and your kiddos enjoy these bars! They look so great, Traci! And I agree – January is a tough eating month. I’m trying to be good, but dang it’s so cold and I just want all the melty cheese! These squares have all my favorite ingredients, so I know I’m gonna love them! Lol Traci! Great minds right?, I long for summer too, but my bathing suit figure has seen better days!! These look absolutely scrumptious. And they would certainly be a hit with Tom too. It’s reminding me of granola all baked up in a tasty bar. And you know my love for granola! I’ll definitely be giving these a go. I’ll keep you posted. Thanks for sharing and have an awesome weekend!